International Diamond Center address, phone, website, hours of operation, and more. For a unique and intimate shopping experience that you won’t find at any average jewelry store, visit your local International Diamond Center showroom. We take great care to differentiate ourselves from other, ordinary jewelers in order to earn your business and trust. 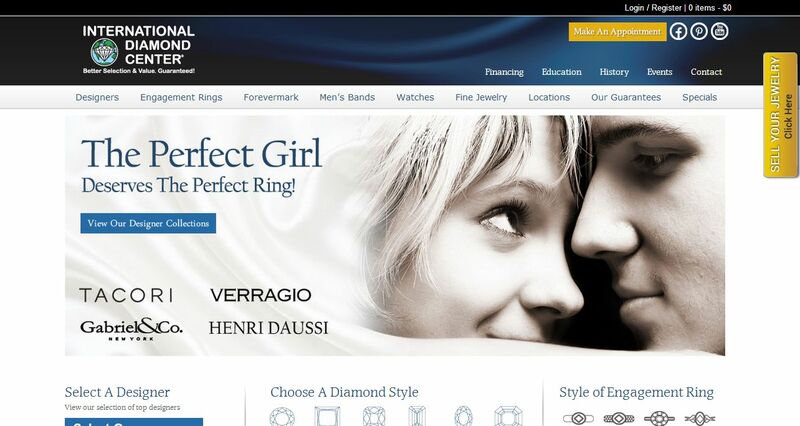 We’re the best place to purchase exclusive bridal jewelry, designer engagement rings, and other fine jewelry. We regularly have a larger selection of diamonds and diamond jewelry than any other local jeweler or national jewelry store chain. We offer virtually every size, shape, and design imaginable with carat weights up to 50. We also feature collections from some of the most renowned jewelry designers in the country, like Tacori, Verragio, Ritani, Scott Kay, Henri Daussi, and Martin Flyer. Our selection of designer diamond jewelry includes everything from breathtaking engagement rings and wedding bands to stunning diamond earrings and pendants. We also offer an extraordinary selection of loose diamonds and precious gems.